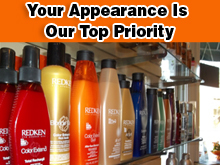 Lakeside Hair Studio is your family-friendly beauty salon in Milwaukee, WI. We have been providing quality salon services for women, men, and children since 2003. All of our licensed specialists enjoy what they do. We consider each client as an individual with his or her own needs and desires. We strive to fulfill those needs and desires with the best talent available. Mission: Our mission is to care for your needs in a manner unmatched by the salons you have visited before. We are owned by Jessica Krysiak, stylist and color specialist, who has been in the business of making clients beautiful for 8 years. She is well-versed in many areas of the industry and is always striving to learn new techniques to meet the current trends. With color being her specialty, Jessica has a genuine passion for the art of hair color design. Contact Lakeside Hair Studio today at 414-483-4247 or LakesideHairStudio@gmail.com to schedule an appointment.